Four cowgirls backed in the box, nodded and rode, pitched a loop, jerked their slack, set their horse so the rope would break from their saddlehorn and stopped the clock in less than three seconds during the championship Finals round of Breakaway Roping at the National Junior High Finals Rodeo in Lebanon, Tennessee the end of June. That’s an intense amount of pressure, yet ranch cowgirl Sawyer Gilbert from Buffalo, South Dakota brought the Breakaway Roping National Championship home with a stunning half-second lead on her competitors after three runs! Sawyer’s roping regimen includes “three things I have to do every run. Make sure I score, make sure I get my tip down, and make sure I follow through,” the cowgirl says. As to keeping book on the calves, Sawyer doesn’t sweat it, “Unless they really duck off or set up bad. They might do something different every time anyhow” she grins. Pretty 14-year-old Sawyer Gilbert is representative of the current crop of youth rodeo athletes – and like the horses she rides, she’s genetically predisposed to success. Sawyer and her rodeoing brother Grey represent the 6th generation of ranching cowboys and cowgirls on the Gilbert Angus Ranch near Buffalo, South Dakota, where they live with their parents Lloyd and Patty Gilbert raising good Angus beef with Lloyd’s parents Ray and Linda Gilbert. Ray and Linda’s offspring Andrea and Lloyd grew up in the sport, where Sawyer’s Aunt Andrea picked up Goat Tying and Breakaway championships in the South Dakota High School Rodeo Association (SDHSRA) on her way to college rodeo where she was Central Rocky Mountain Region’s Breakaway champion and helped her University of Wyoming team gather up three National Intercollegiate Rodeo Association (NIRA) Women’s Team National Championships. 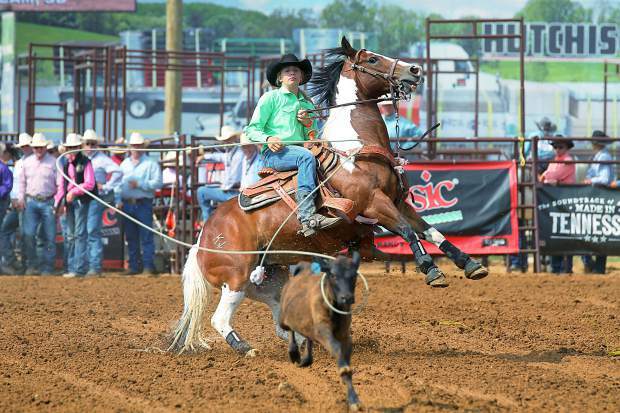 Sawyer’s dad Lloyd roped calves and team roped, plus bulldogging well enough to carry off a SDHSRA State Championship before joining the LCCC team from Cheyenne where he earned Central Rocky Mountain Region Steer Wrestling championship status within the NIRA. That naturally led to PRCA competition with success at some of the big ones, including the famed Reno Rodeo. Reared on a ranch in North Dakota, Sawyer’s mom Patty Simonson Gilbert focused on other sports and now utilizes her Sports Medicine degree as a P.A. with a clinic in Bowman. She has her own important rodeo link, working with the Justin Sports Medicine teams for both South Dakota high school and Prorodeo events. Since then the duo have competed in the National Little Britches Rodeo Finals in the Lazy E Arena at Guthrie, Oklahoma, hauling still more loot home to South Dakota. By an almost unbelievable mathematical phenomenon, Sawyer was Runner Up to the National Breakaway Champion by one-hundredth of a second over three runs! Along with her brother Grey, Sawyer finished 7th in the Team Roping world standings and the average. Grey also picked up 4th in Flag Racing world standings and the average. The siblings were competing at a South Dakota 4-H Rodeo when I caught up with Sawyer for this interview. “We’re getting qualified for the 4-H rodeo State Finals,” she explained, adding “I think there’s a Ty Tuff goat tying coming up, too.” That would prob’ly be the July 30th Bowman, North Dakota event – perfect for Sawyer because it also includes a breakaway jackpot. “And we might go to the timed event championships in Huron,” the busy cowgirl adds. The promo’s say that South Dakota State Fair event Sept. 3-4 “showcases the midwest’s finest youth rodeo talent.” Just the place for cowgirl Sawyer Gilbert.